The 10 Best Road Races in Massachusetts! Massachusetts people run. Their road races are so well-known and well-loved that they bring in people from all 50 states—and even from around the world—to run them. The following 10 are the best road races in Massachusetts, as defined by some of the state’s seasoned runners. 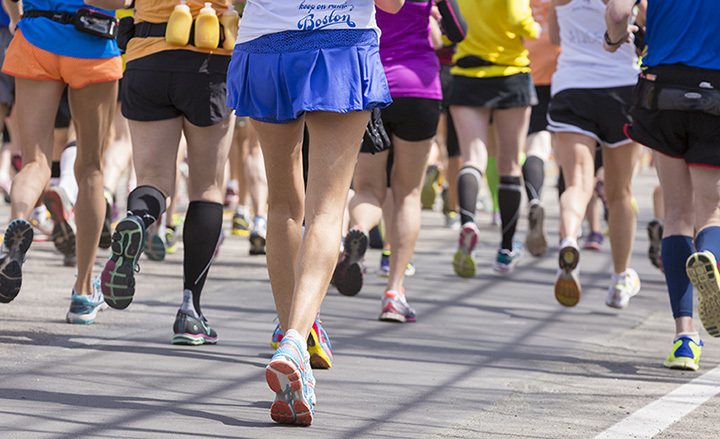 Lace up those running shoes and check out the 10 best road races in Massachusetts. Taking place on a one-loop certified course in Cape Cod’s town of Falmouth each October, the Cape Cod Marathon has drawn runners and observers since its inception in 1978. It was once dubbed by Runner’s World magazine among the 10 “Most Scenic” marathons in the U.S. Runners typically hail from all 50 states and Canada, as well as from a handful of other countries. James Joyce was an Irish author who died in the early 1940s. Known for his work of comic fiction, Finnegan’s Wake, a Dedham runner was struggling to read the book in the 1980s, and even compared reading it to training for a race. Martin Casimir Hanley was inspired by his thought to found a race, and thus the James Joyce Ramble was born. Each year the 10K is dedicated to a quirky writer and serves as a fundraiser for local charities. People read excerpts from Joyce’s book along the course. The ramble is traditionally held the week after the Boston Marathon. Born in 2004, Boston’s Run to Remember honors all Massachusetts law enforcement officers who died in the line of duty. Sadly, that number has increased in recent years. A five-mile race and half marathon are run. Both start and finish at the Seaport World Trade Center. Runners don their ugliest Christmas sweaters and take off on this 10K run. The Ugly Sweater Run Boston is run in conjunction with other state’s and city’s Ugly Sweater Runs in the country. Boston’s is scheduled for Dec. 10. Held in Plymouth, the Trick or Trot 5K and 10K races take place just before Halloween, with this year’s scheduled for Oct. 29. In addition to the 5K and 10K, there is a half-mile fun run for all ages. Halloween costumes are strongly encouraged for all runners. The Boston Marathon is world-renowned. People from all over the globe arrive in the city in April each year to run the famous event. Run by the Boston Athletic Association, it is the world’s oldest marathon and one of the world’s most prestigious running events. In support of Earth Day, the Earth Rock Run Half Marathon takes place in North Andover and Boxford, with proceeds benefitting local conservation and ecological efforts. Those registering ahead of the March 2017 deadline will get a recycled sweatshirt in keeping with the theme. This 5K/10K run/walk located in Wayland is family friendly and its proceeds benefit Neighbor Brigade, a service for families experiencing sudden Pam’s Run is named in honor of the late Pam Manikas Washek, who founded Neighbor Brigade. Not to be confused with the Boston Marathon, the Boston Half Marathon is run in October and typically draws over 5,000 runners. Proceeds from the race benefit the Dana Farber Cancer Institute in Boston. Drawing close to 2,500 runners, the South Shore Marathon—which starts in Norwell—is a favorite among Massachusetts runners. Taking place in November, this year marks the third. Runners sing the praises of the planning, support, shuttle services and volunteers who make the race a success. Whether you run or you simply wish to cheer on those who do, you have plenty of opportunities to fuel your passion in Massachusetts. New Englanders are a hardy bunch, and Massachusetts runners are proof positive of that claim. View more Massachusetts Road Races.